In the name of not wasting once-in-a-lifetime opportunities, we figured it would be good to have a website for our new interiors business. It's been near-torture to keep it under wraps until now! Click the pic to take a tour - designed by the dear and amazing Christopher Lopez-Thomas. Port took all the photos. 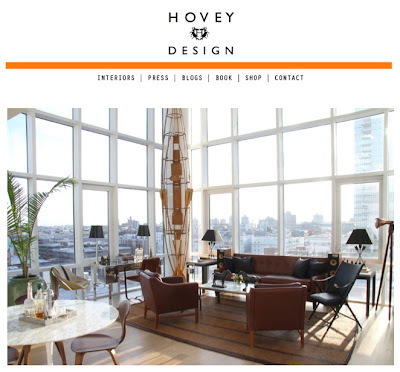 You can also tweet us up at @hoveydesign! So many Congratulations!!!! The website looks great and the article in the NYT is awesome! Well deserved a million times over, can't wait to see where it goes. And let me know if you guys ever need any help sourcing stuff - coming from the opposite corner of the country, I'd be happy to help if ever I can. The site looks amazing! Love your work! Bravo, very well done! And much deserved NYT piece! Very inspirational, as always! Congrats! Great design work, can't wait to see more. How exciting Congratulations Ladies! Off to peruse! Please some and enter the Grand Finale Holiday Giveaway from Greyfreth! You will love it! Big congrats!!!! It seems a no brainer to see you stylish ladies take it to the next level, but I imagine making the jump was a little scary. Three cheers to staying true to your vision! Congrats! I was wondering when this was going to happen. The article in NYT was great, I love your style. All the vintage items were wonderful. It was very masculine but still felt light & airy. May I make a suggestion on your blog (sorry I wanted to send you a private message but couldn't see a contact me option). The black background with small white text is so difficult to read. Your content, however, is truly awesome. I'm glad I visited. This is insanely exciting news! I seriously can't wait for the shop to open! Prediction: art consulting and a genius show curated by HHH! Exciting news, and the NYT piece looks awesome. What a great note to end 2011 on!